Potassium is a vital mineral to human body’s functions. 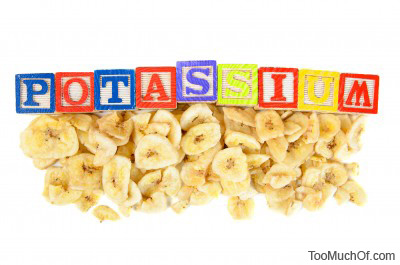 Naturally, potassium can only be found in ionic salts and is a component of many mineral compounds. Potassium ions play an essential role in function of living cells, including regulation of fluid and electrolyte balance. The process of diffusion of potassium ions is the primary method of nerve signal delivery. Deficiency in potassium in living humans results in hypokalemia. A disrupted nerve signal transmission or electrolyte imbalance due to hypokalemia (potassium deficiency) may result in a chain of disorders that can cause muscle pain associated with impaired function of muscle cells, gastrointestinal tract malfunction resulting in cramping, cardiac disorders causing heart arrhythmia and palpitations, kidney function disorders, peripheral neuropathy, dizziness, extreme thirst and urination. Even though potassium is a mineral required by a human body to function, too much potassium accumulation can cause many of the same side effects and disorders that a deficiency does. Excess intake of potassium in form of supplements, kidney failure and certain medication can cause hyperkalemia. The condition is diagnosed when the blood concentration of potassium is above 6 mEg/L. The human body has mechanisms of dealing with excess of potassium via transferring of potassium ions from blood to urine and vomiting reflex. However, the system can be easily overwhelmed with excessive supplementation or intravenous injections, which result in hyperkalemia that aggressively impairs the renal function. The best method of getting a sufficient amount of potassium is via a rich and balanced diet. Unless a moderate potassium deficiency has been established via a blood test, additional supplementation of potassium should only be considered under a supervision of a doctor.